High Chance PSY Characters in Rare Recruit! Tsuru’s Stopping at Special island for a couple weeks! 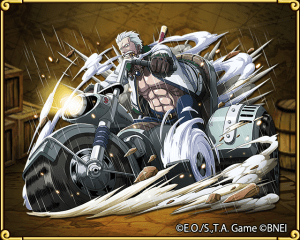 Garp the Hero is stopping at extra Island! High Chance INT Characters in Rare Recruit! Drum island is the next island after Little Garden. This opens up some new characters for us, and let us farm Chopper. The most notable character is Wapol, a STR Shooter with an Attack of 835, RCV 142 and high HP of 2,940. Wapol also has an interesting captain ability; Heals 10x of current Recovery every turn (Vivi still heals for more). We also get more places to farm for Plated lobsters. Biker smoker is stopping at extra isle! High Chance STR Characters in Rare Recruit! Its that time again were Bandai Namco are feeling generous! Checkout the freebies this event has to offer. Attack from weakest to strongest against strong enemies to multiply your strongest attack.